OmniGo is three circulator service routes serving the communities of Chino Hills, Grand Terrace and Yucaipa. OmniGo features 16-passenger vehicles and fixed route fares, enabling residents of these communities to have access to major area destinations. Frequency of the circulators ranges from 30 to 70 minutes and all three routes provide service on weekends. For more information, go to the OmniGo page. 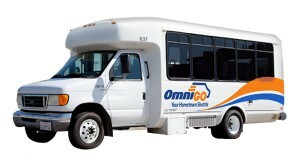 OmniGo vehicles currently in operation are 25 feet long, 16-passenger cutaway vehicles. The smaller size of these vehicles allows for navigation through narrow residential streets more cost-effectively than standard 40-foot vehicles. For More Information please see Section 3 of the Transit Design Guidelines. The purpose of these guidelines is to develop suggested design criteria that should be considered when designing and placing transit facilities. Please contact Omnitrans to discuss the specifics of your project. This information is not to be used as a set of standard details on which to base a final design, but rather as recommended criteria and general guidance for the placement and safe design of transit facilities. It cannot be overemphasized that these guidelines must be used in conjunction with sound evaluation of the facts and planning/engineering judgment. These guidelines are intended to be used for actions on new or revised stop locations, and do not intend to apply to existing stop locations. Local jurisdictions, in endorsing these guidelines, indicate their general acceptance of the information provided. Their acceptance of these guidelines does not modify or supersede their current standards and/or policies otherwise adopted by the jurisdiction. It is also important to note that the preferred dimensions should be planned for, and minimum dimensions are applicable only in specific constrained circumstances.